Q. I have a flaking, dull, and dirty transparent or semi-transparent stain on my deck. How can I restore it with ABR Products? A. 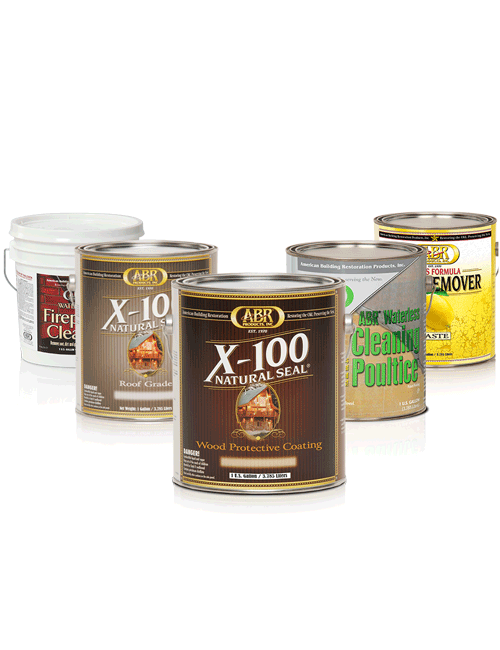 Using the ABR Fast Finish Remover followed by the X-180 Weathered Wood Restorer will make your deck ready to treat with the X-100 Natural Seal in the color of your choice. Follow the detailed instructions on our web site, product labels or product specification sheets. Q. What should I use to clean my wood? A. ABRP, Inc. manufactures the finest wood prep cleaners and wetting agents* on the market today. You may choose from our biodegradable soap concentrate “ABR Deck and Siding Wash” where one gallon makes 10 gallons of cleanser for decks and siding at 150 to 175 sq ft per gallon. The X-180 Weathered Wood Restorer is an oxalic acid soap best for the restoration of cedar and redwood. Each of these wood species will darken and discolor over time and with exposure to nature. The X-180 Weathered Wood Restorer will bring the natural color back to cedar and redwood without bleaching. *If you have siding or a deck and the surface has been neglected to the point where it looks as though there is no treatment (stain or water repellent) left on the surface, you may want to use the ABR Fast Finish Remover as a wetting agent followed by the X-180. This two step process will bring back the natural color of the wood and remove oxidation and any doubt that the surface is ready to be preserved. If there are remnants of past water repellent applications in the wood, the result maybe an uneven appearance when the X-100 Natural Seal it is applied. Q. Do I have to clean my wood before applying the X-100 Natural Seal? A. Yes. Never paint or stain any surface without cleaning that surface thoroughly. Failure to do so will greatly affecting the products performance. Q. Do I have to strip my wood before applying the X-100 Natural Seal? A. Yes. The previous product may interfere with the X-100 Natural Seals ability to penetrate the wood greatly affecting the products performance. The most frequent problem that we have seen year after year is film forming products that have failed. The costly removal process that must take place afterward, which affects the integrity of the logs from strippers and sanding. There is also the risk of rotting under the film forming product which is a problem not only because it is aesthetically unappealing, but it is also very costly to repair. What should I know about using a finish that produces a shiny film? Answer: We do not recommend using water-based/oil-based film forming finishes, such as varnishes and urethanes. These products are not suitable for exterior finishes due to ultraviolet radiation penetrating the transparent film and degrading the wood. Regardless of the number of coats, the finish will eventually become brittle and develop severe cracks, exposing the wood to further degradation. See the below chart for more information. What about using a water-based finish? Answer: We do not recommend a water-based log finish as the first coat, because it swells the outer wood fiber, prohibiting the ultimate penetration when it is most needed. Try dropping water on toilet tissue, which is a byproduct of wood. Watch it swell. 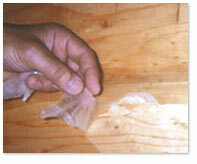 Then drop a small amount of Log-Gevity™ Log Stain & Stabilizer oil-based penetrate on the tissue. See the penetration for yourself. Why is using Log-Gevity™ Log Stain & Stabilizer so important? Answer: Log-Gevity™ Stain & Stabilizer is fortified with both metallic UV inhibitors and zinc borates which prevent the process of ultraviolet radiation degradation and water repellants that prevent moisture intrusion. Note the photographs to the left that display a non-stabilized vs. stabilized log. For new logs, it is important to apply a stabilizer to help lessen stress cracks and voids caused by age and moisture intrusion. For restored logs, it is important to fill those cracks or voids with this oil-based penetrate such as Log-Gevity™ Stain & Stabilizer to prohibit further stress. Log-Gevity™ Stain & Stabilizer has all the necessary protection before, during and after the construction phase. No other pretreatments are required. After cleaning your logs, you may also use Log-Gevity™ Stain & Stabilizer to rejuvenate the color, especially if it has faded substantially from sun exposure. Using the stabilizer for color rejuvenation is an easier more cost effective solution.